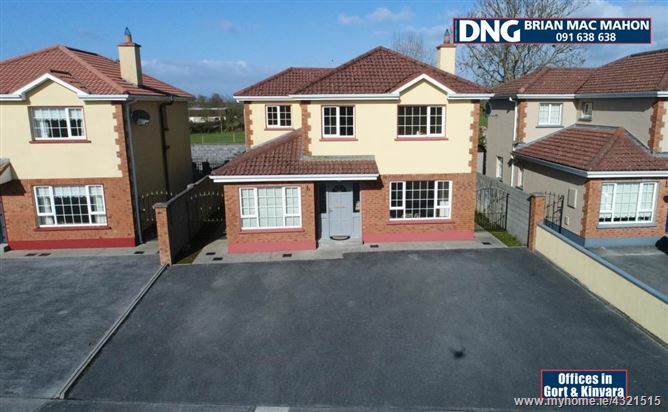 Walk through this property using our 3D virtual tour.............3 The Punchbowl is new to the market and is located on the Ennis Road, South of Gort town. Its brilliant location means that most the amenities are within walking distance. This lovely 4/5 bedroomed, detached, home is in turn-key condition and is a ideal for a family, or a first -time buyers dream or even as an excellent investment opportunity. On entering the hallway with its carpeted floor, to the left is a good-sized bedroom/office/study with neutral carpeted floor, the spacious but cosy sitting room is to your right, again fitted with a neutral carpeted floor, coving, ceiling rose and a feature fire place with solid fuel stove. A glass panelled door takes you through to the bright kitchen/dining room with its tiled floor, wooden fitted kitchen and breakfast bar, double doors opening out onto the patio area and a large private rear lawn garden. There is also the utility room and a guest w.c. off the kitchen. Going upstairs, off the landing are 2 double bedrooms with fitted wardrobes (master bedroom en-suite) and 2 single bedrooms with fitted wardrobes. Completing the accommodation upstairs is the main bathroom. Gort is a busy, friendly market town with excellent childcare facilities and both Primary and Secondary schools available, a choice of supermarkets, restaurants, pharmacies, a hotel with full leisure centre and lots of sporting amenities. The town has excellent transport links with easy access to the M18 motorway linking Galway and Limerick, both only a 35 minute drive. Daily hourly bus service to Cork, Limerick and Galway and it also has its own railway station to Galway, Ennis and Limerick.